Edelweiss James Please Note: Whilst every care is taken in checking promoted links, we cannot accept responsibility for your use of third party web links. I wrote the following article in 1992 and I believe that it is still relevant although my understanding of the field has greatly increased. Rather than altering the article I have added this brief introduction and update notes - numbered in the main text. apparently hundreds of them had been issued by 1893. (2) The St. Bartholomew’s Medal, donated by the Cloth Workers, is indeed made of gold. (3) I am now certain that the badge I have is from the City of London Sick Asylum. (4) Christs Hospital is not a hospital but a school. contains scant details and even then only for those currently registered. Finally, my collection is now very much larger and I am busily producing a fully illustrated catalogue which should be available early next year. I am also making steady progress with my book on hospitals and badges which could also be available next year (although I started work on this in 2006). Have you ever seen the television series 'Casualty' or the television news and noticed that the nurses are often wearing badges? These badges have a little known history going back to the second half of the 19th century. It is not known, for example, when and where the first nursing badge was issued - nor who received it. Researching the history of nurses badges (and for convenience I will include medals in this term from now on) can be very frustrating. In many books on the history of nursing or the history of particular hospitals or groups, there is often only a passing reference to the nurses training school and whether they issued badges or not; very seldom does one find a badge illustrated in the book with details of dates, design and material. These hospital histories are written mainly by doctors who often ignore the fact nurses, porters, kitchen staff, etc. are all vital in the running of any hospital. Often when a hospital is closed - whether demolished or amalgamated with others - the most enduring thing about it is the badges which were issued to nurses at the end of their training. Many times I have pored over old photographs of nurses with a magnifying glass trying to make out the details of the badges they are wearing - often with little success. The ‘powers that be’ in the nursing profession have a curious attitude to the badges issued to trained nurses. The General Nursing Council (now defunct) expected that when a nurse died their relatives or executors would send back the badge issued by the Council. This may explain in part, why it is difficult to come across groups or pairs of badges for the same person. It sometimes went further than that. Last year I was talking to a Nightingale (a nurse who was trained in St. Thomas's Hospital, London). She said that when nurses were presented with their medals in the 1950's they were told that their badges should be buried with them! The General Nursing Council seem to have a thing about personation (one person pretending to be another) and about hospitals being satisfied that a person is trained if they have a nursing badge. They have been known when approached by an unsuspecting collector asking for information to demand the badges back saying that they are their property - they did pay compensation but it did break up several pairs (I consider that a pair or group of badges presented to the same person are more interesting than a single badge). This body has now been succeeded by the United Kingdom Central Council for Nursing, Midwifery and Health Visiting (UKCC). They hold registers of all nurses trained in the United Kingdom since 1921. However they will not divulge the training place of a nurse even if she was trained 60 years ago (I unsuccessfully tried to find this out only recently)(5). 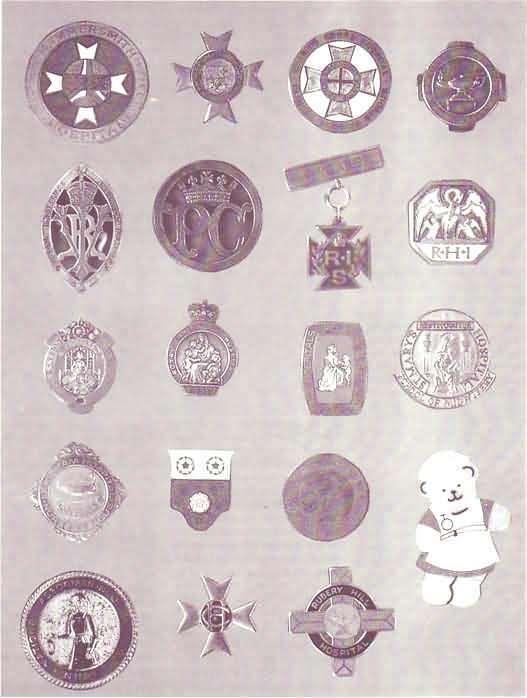 Nurses badges were not only issued by central training organisation such as the GNC and the (Royal) Medico Psychological Society but also by such professional organisations such as the Royal College of Nursing (the RCN have issued a wide variety of badges over the years). Other modern organisations such as the Association of Radical Midwives also issue badges. Many District Nursing organisations prior to 1948 issued their own badges - examples include Cardigan and Lincolnshire. The umbrella organisation for district nurses -now called the Queen's Institute of District Nursing - has also issued a variety of different badges under its different names. The earliest documented nurses badge that I have come across is a Liverpool Nurse Training School Medal (1). Honor Morton, author of the book 'How to become a Nurse' - published c 1896, says that this badge was first issued by the Royal Infirmary on 18 January, 1862. The badge was lent to the probationer after a month's trial and she was allowed to keep it after completing her three year training. Another early item is the St. Bartholomew's (London) Gold Medal which, again according to Honnor Martin, was awarded every April and October to the probationer who was first in the final examination. She tells us that it was first presented in 1885 and was made possible by the generosity of the Cloth workers Company of London. Be warned though, 'gold' medals often turn out to be silver gilt (I do not know if this applies to the Bartholomew's medal above)(2). Many hospitals gave out one gold medal a year. Some, such as the London Temperance Hospital gave out gold, silver and bronze medals - bronze after passing the end of second year examinations, silver after passing the third year examinations (and also a certificate) with the best of year nurse receiving a gold medal instead and being then called the gold medalist. The word 'hospital' used to have a much wider meaning than now. My husband once bought me a really lovely gold hallmarked badge from Christ's Hospital - it turned out that this was a school(3). I have another badge for another Christ's Hospital founded by Peter Symonds in 1607 which I suspect is an alms house(4). Modern badges are usually made of base metal - chrome or brass. They have little engraving but can still have enameling with several different colours (a lot of Scottish badges however are still made of silver). The use of mottos- whether in Latin or English have also gone out of fashion. In this age of economies, a lot of training schools and, indeed, the UKCC itself no longer issue badges to nurses on completion of their training. As a result of this shortsightedness, I suspect that a nurses badge is not such a prized possession as it was some 20 years ago. Favourite subjects for decorating badges are: a Red Cross, a Roman Lamp and the Good Samaritan. The Royal College of Heraldry considers that the Roman Lamp is the symbol of the nursing profession. Another common theme is the Rod of Aesculapius - that is, two snakes entwined round a staff. Aesculapius was the Greek god of healing. Sometimes local landmarks or part of a local coat of arms are shown on the badge issued by the hospital in that area. Very occasionally, a hospital has its own coat of arms. Midwifery badges very commonly include scenes of mother and baby, baby in swaddling clothes and, surprisingly, storks. You would have thought that midwives of all people should realize where babies come from. Mottos, if not taken from the local coat of arms, expect the nurse to be God fearing, obedient, compassionate, self sacrificing, hard working and trustworthy - there is nothing about independence or intelligence. The nursing stereotype of ministering angel also figures strongly. PC. Most likely a Nurses Badge. R.I.S. One of a pair? Royal Infirmary? R.H.I. Almost certainly a Nurses Badge but which hospital or Infirmary? Can you help? Queens Hospital but which one? Birmingham or Croydon? St. Mary's Hospital School of Midwifery. London? Can you help? CH Another mystery badge. Charing Cross Hospital? In the late 1960's, the General Nursing Council for England and Wales was issuing on an annual basis some 11,500 SEN (State Enrolled Nurse) and 17,000 SRN (State Registered Nurse) plus smaller numbers for the other parts of the Register - RMN (Registered Mental Nurse), RSCN Registered Sick Children's Nurse) and RNMD (Registered Nurse for Mental Defectives). In the past, another part of the Register was RFN (Registered Fever Nurse). In England and Wales, nurses who were qualified on more one Register had a single badge with the appropriate qualification and dates on the back. In Scotland, different badges were given for each part of Register. Most of those registered and enrolled nurses - not to mention the trained midwives - also had a training school badge. There must therefore have been hundreds of thousands of nurses badges issued in the past - and they are still being issued. I have about 1,000 different British nursing badges in my collection. It sounds large but only represents a small fraction of those issued. Many hospitals such as the Hammersmith and Charing Cross (both are in London) have changed the design of their badges many times. Others such as the Ancoats (in Manchester) and St. Bartholomew's have not changed the design for decades. Badges have been given for long service - an example here being that given by the Institute of District Nursing for 21 years service. In 1894, Guy's Hospital (in London) started to give a silver medal to nurses who had served in the hospital or had been a private nurse visiting people at home in the area for more than 5 years. This is a fairly common badge and, in the Burdett's Nursing Directory of 1898, a large number of nurses said they had it. I do not know when it was last issued. Sometimes, I have come across a badge which only has the initials of the organisation which issued it. This causes problems - is it a nursing badge or not? For instance, I have a badge with the initials CLSA together with the City of London coat of arms. There was a City of London Sick Asylum which in 1900 was listed as training nurses. The question arises - do I have one of its badges? Other times, one comes across a pair of badges - one being issued by the General Nursing Council and the other with just initials. Here one is sure that it is a hospital - but which one? For example, what hospital was RAH (the badge was issued to a man)? Many of those hospitals which are for the mentally ill or the sub normal seldom mention what kind of hospital they are. On the other hand, children's and maternity hospitals almost always do so. Fashions never really change! 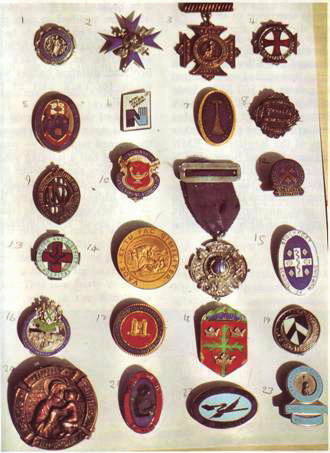 A large number of badges contain the words 'League of Nurses' or 'Nursing League'. These are in the nature of old girl networks of those who trained at the same hospital. Sometimes, they issued badges to nurses before the hospitals themselves did - an example here is The Royal South Hants Hospital in 1902. There have been badges issued for particular occasions. At least 9 nurses received medals for looking after the sick in the Typhoid Epidemic of 1894/95 at Newport, Isle of Wight in which there were over 500 cases and over 50 deaths. I am happy to say that I have one of these medals. Many of the older hospitals started as workhouses which contained an infirmary for the chronic sick. These gradually evolved into separate hospitals - often changing their names and over the passage of time becoming much loved by the local community rather than being greatly feared. The nurses and staff working in these infirmaries had their own training organisations and trade unions. Examples include the Poor Law Workers Union, the Poor Law Officers Union, the National Union of County Officers, and the Hospital and Welfare Services Union - these came together in 1948 to form COHSE. Most of these unions issued badges but I do not have them in my collection. Both COHSE and NUPE have issued badges for their nursing sections - these are just as attractive as many of the modern training school badges. Some regions of COHSE in the North East of England issue their own badges. Some nurses are very dismissive of union badges - it is only recently that the Royal College of Nursing has regarded itself as a union. I believe, however, that such badges form an essential part of nursing history. Some of the early nursing trade unions issued badges that I would give my eye teeth for. Examples include The National Asylum Workers Union and the Mental Hospital and Institutional Workers Union. Can anyone help? I think that the 1920's were the heyday of nursing badges with many hundreds of different training schools and perhaps a hundred nursing organisations. The General Nursing Council however had a supervisory role in the training of nurses and it laid down increasingly stringent requirements such as the number of beds and the range of expertise available in the hospital. Over the years, the number of training schools has substantially reduced. Now there is often one training school in each District Health Authority (there are now 192 of these in the whole of Britain). Not all of these still issue nursing badges. I think it is very sad that a long standing tradition has been broken for extremely marginal cost savings. In 1983, the different training organisations amalgamated to form the UKCC. Before this there were such organisations as the General Nursing Council, the British Orthopedic Association and Central Council for the Disabled and the Ophthalmic Nursing Board (this is not a complete list). All of these organisations stopped issuing badges and the UKCC never did do so - this caused a great deal of dissent in the profession. A book has recently been published called 'British Nursing Badges - An Illustrated History'. It was written by Jennifer Meglaughlin (who has since sadly died). It is published by Vade Mecum Press, 31-35 Great Ormond Street, London WON 3HZ and gives a very good introduction to the subject. I would be very pleased to hear from anyone who is interested in nursing badges and nursing history. I would also be very interested in hearing from anyone who has badges - perhaps awarded to deceased relatives - with a view to my either recording their existence or buying them for my collection.